The U.S. government has declared war on WikiLeaks. So far the "one guy," WikiLeaks founder Julian Assange, has been arrested and denied bail in the U.K. His website has been pummeled by a series of covert and overt attempts by governments and businesses around the world to cut off its oxygen supply, but the efforts have not stopped the information flow. Electronic Frontier Foundation co-founder John Perry Barlow tweeted that the "first serious infowar is now engaged, and the "field of battle is WikiLeaks." WikiLeaks appears to be holding its ground for now. Assange and WikiLeaks are being treated as outlaws without formal legal charges, although U.S. Attorney General Eric Holder said, "We have a very serious criminal investigation that's underway, and we're looking at all of the things that we can do to try to stem the flow of this information." Sen. Joe Lieberman (I-Conn.) chairman of the Senate Homeland Security and Governmental Affairs Committee, called WikiLeaks "an outrageous, reckless, and despicable action that will undermine the ability of our government and our partners to keep our people safe and to work together to defend our vital interests. Let there be no doubt: the individuals responsible are going to have blood on their hands." House Homeland Security Committee member Rep. Candice Miller, R-Mich., called WikiLeaks a terrorist organization. "It is time that the Obama administration treats WikiLeaks for what it is -- a terrorist organization whose continued operation threatens our security," she said. On the electronic battlefield, a series of denial of service cyberattacks and denial of service by hosting companies, including Amazon, have attempted to disrupt the flow from the trove of more than 250,000 diplomatic cables extracted from a U.S. government server, allegedly by Private First Class Bradley Manning, a 23-year-old Army intelligence analyst. Currently, WikiLeaks is hosted on Swedish servers, which have been under cyberattack this week. Sen. Lieberman, who advised Amazon to deny WikiLeaks service, called for other companies to follow the example set by the company's web service division. "The company's decision to cut off WikiLeaks now is the right decision and should set the standard for other companies WikiLeaks is using to distribute its illegally seized material," he said. PayPal and MasterCard cut off financial support mechanisms. On Tuesday, Visa said it has suspended all payments to WikiLeaks pending an investigation of the organization's business. A Swiss bank, PostFinance, has frozen WikiLeaks founder Julian Assange's legal defense fund. U.S. government scientists have been blocked from accessing WikiLeaks' websites for fear the data will "contaminate" their computers. The cyber-battle is not one-sided. WikiLeaks also has exploited the decentralized nature of the Internet to remain functional. Assange and his WikiLeaks cohorts also have an insurance policy. About 100,000 WikiLeaks supporters have been given an encrypted file of WikiLeaks data, some potentially damaging to the U.S., that would be unleashed in the event of aggression that compromises its operations. "If something happens to us, the key parts will be released automatically," Assange has said. Hundreds of "mirror sites," which copy the data of the WikiLeaks site, have also been set up. In addition, an anonymous hacking group has started to attack organizations, including PayPal, who denied services to WikiLeaks, Computerworld reported. Twitter and Facebook have not closed the WikiLeaks accounts on their social networking sites. The elephant in the room is whether the U.S. Department of Justice will file charges against Assange and WikiLeaks. U.S. government officials are considering what laws might apply to prosecuting Assange, outside of the outdated Espionage Act of 1917. Holder has been mostly silent on the subject since his initial statement about a "very serious criminal investigation." Pfc. Manning was charged in July with violations of the Espionage Act. The government would need to prove that Assange, an Australian national, and WikiLeaks conspired with Manning to procure and release the documents to bring serious charges. The secret State Department cable exposed by WikiLeaks and subsequently covered extensively in the press listing sites vital to U.S. national security and public health has created greater security concerns that details about the personality quirks of world leaders. "Leaking a list that purports to lay out critical infrastructure is like painting a target on the companies or the entities which are listed," said Michael Chertoff, former Secretary of Homeland Security. Sen. Lieberman believes the press, specifically the New York Times, should be scrutinized by the Department of Justice for publishing documents from WikiLeaks. "I certainly believe WikiLeaks has violated the espionage act. But then what about the news organizations, including the NYT, that accepted it and distributed it. I'm not here to make a final judgment on that. But to me the New York Times has committed at least an act of bad citizenship, and whether they have committed a crime I think that bears very intensive inquiry by the Justice Department," he told Fox News. "And, again, why do you prosecute crimes? Because if you don't, well, first you do because that's what our system of justice requires. Second, if you don't prosecute people who commit crimes, others are going to do it soon and again. And I'm afraid that's what's going to happen here." Kevin Bankston, a senior staff attorney at the Electronic Frontier Foundation, maintained that the government is leery of shutting down WikiLeaks. 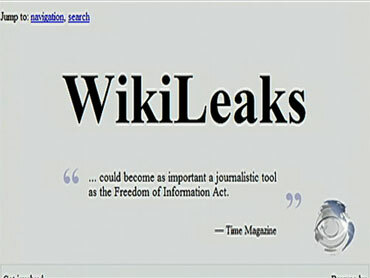 "The reason the government hasn't acted to take down WikiLeaks is it knows, as does every First Amendment scholar, that would run afoul of the Supreme Court's decision in the Pentagon Papers case," Bankston told Politico. "Under the First Amendment, the legal presumption is strongly in favor of free speech and against prior restraint. The government would have the burden of demonstrating serious, really imminent harm and would have to do so for each document it wants to enjoin." Assange is now behind bars in London for alleged sexual crime charges committed in Sweden, and fighting extradition, but WikiLeaks isn't deterred on its mission, as in this tweet from the elusive organization: "Let down by the UK justice system's bizarre decision to refuse bail to Julian Assange. But #cablegate releases continue as planned." In other words, check your favorite news website for the latest redacted CableGate revelations.